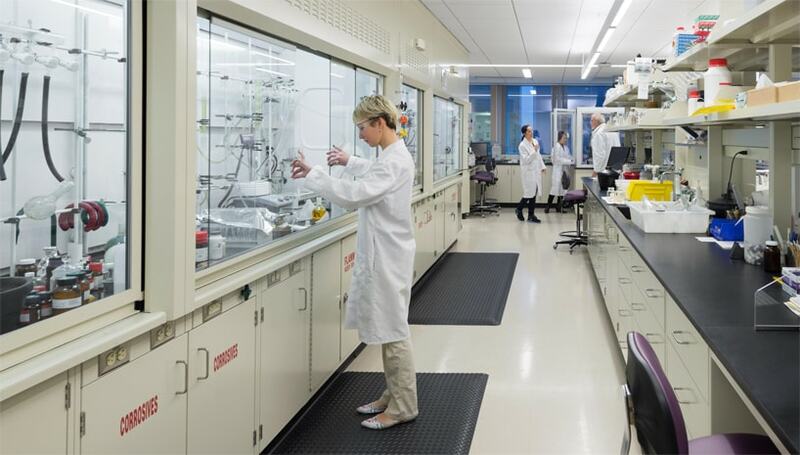 For 10 years in a row The Boston Business Journal has named the Massachusetts-based Vertex Pharmaceuticals, a cutting edge biotechnology firm, to its Best Places to Work list. 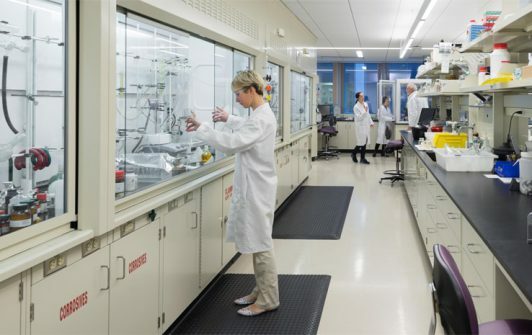 When Vertex decided to consolidate its 10 facilities into one collaborative campus, it emphasized this commitment to employee satisfaction and dedicated a 40-person team to research the best options. The team visited the California headquarter campuses of Apple, Google and Pixar – corporations heralded for innovation – to get ideas. 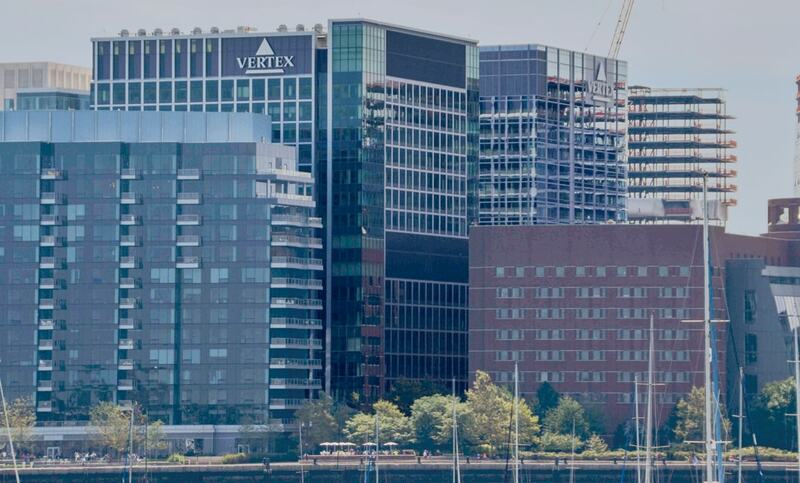 After years of planning, Vertex had the answer: move over 1,200 employees from 10 different locations to one corporate headquarters at Fan Pier, a 21-acre mixed-use waterfront development along the Boston Harbor. And the company had the perfect partner to make it happen, AHA Consulting Engineers (AHA) a leading engineering design firm with a strong portfolio of corporate, science & technology and mission critical experience. 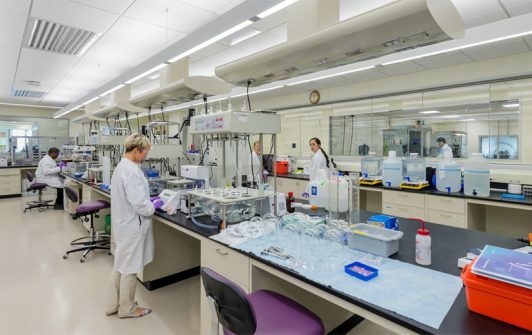 Having worked with Vertex for 15 years and on 50 projects, AHA was trusted to engineer the biomedical company’s research, laboratory and office spaces into one cohesive campus that made sense for its employees and its diverse business. 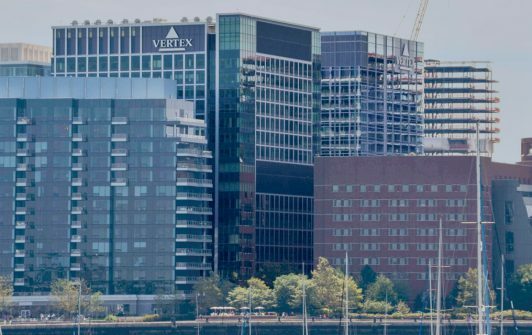 From its location at Fan Pier, Vertex became the first anchor tenant at the largest commercial project in the nation at the time – a 1.1 million-sf two-building campus. Its 15-year, $1.1 billion commercial lease is the largest in Boston. 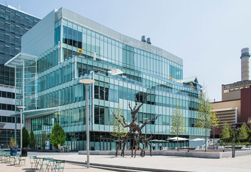 Founded in 1989 in Cambridge and renowned for developing treatments for hepatitis C and cystic fibrosis, the global biotech firm envisioned a campus that would attract the brightest minds in its hyper-competitive industry. Wish list items included a cafeteria serving gourmet meals, a waterfront patio where employees can dine during warmer weather, a state-of-the-art gym, 200-seat auditorium and ground-floor retailers curated to appeal to employees short on leisure time. To encourage future scientists and engage the community, Vertex also requested a 3,000-sf research lab space for use by students from local high schools. AHA delivered each of these program elements by designing the mechanical, electrical, plumbing and fire protection systems both buildings. Each 16-story structure includes spaces for retail, office and laboratories, as well as three levels of underground parking. 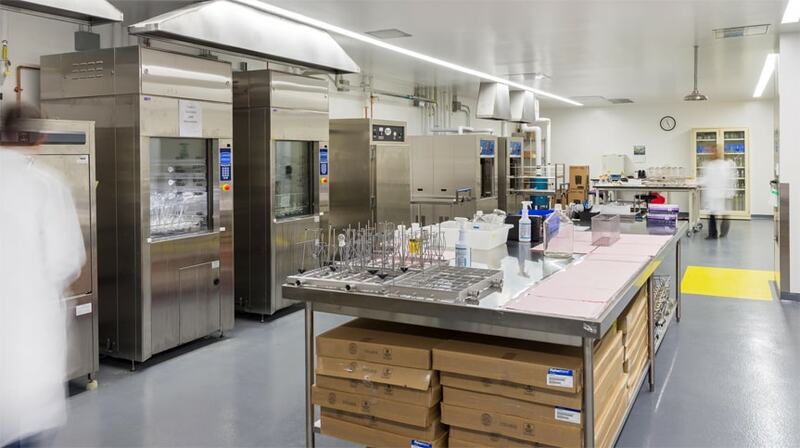 To successfully research treatments for conditions like cancer and osteoarthritis, Vertex required innovative engineering for its vivariums, BSL-2 labs, chemistry labs, MRI spaces, radiology labs, wet labs and other specialized spaces. AHA understood its business and offered workable design solutions for each of Vertex’s multi-purpose spaces. 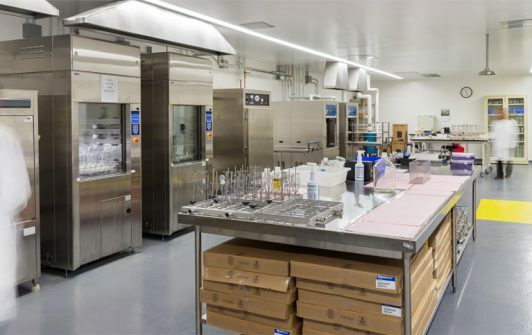 This high-profile campus project presented unique challenges to AHA in the form of a tight design-build schedule that offered little wiggle room for delays, the location of the lower-level labs and the aspiration to achieve LEED Gold. AHA tailored the mechanical system design for each component of the campus while servicing the entire campus appropriately. 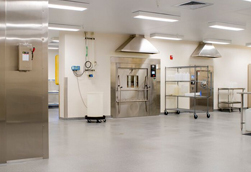 Vertex’s labs, which feature fume hoods, require far more airflow than the offices. Since the labs are located below the office space and the ductwork needed to terminate to the roof, AHA brainstormed over how the ductwork could be installed. “The most difficult part of the design was the geometry of the ductwork,” said Joseph P. Kazlauskas, Vice President at AHA. “Making the extensive system fit into the ceiling while ensuring it could handle the air flow tested our engineers’ creativity.” To visualize the final product during design, AHA utilized Building Information Modeling (BIM) to solve the complex ductwork and plumbing requirements early in the design process. AHA evaluated several energy solutions for the buildings to achieve the lowest energy costs. “To reduce the power draw, we used multiple air-handling units, chillers and boilers, so the units could be staged and operate based on building demand,” said Kazlauskas. “Motion sensors in each of the hoods activate only when people stand in front of them. When the hoods are not in use, the air flow is reduced by 35%.” AHA also specified the use of low-flow plumbing fixtures throughout the Vertex campus. The campus meets a variety of corporate needs for Vertex. It provides working and collaborative space for chemists, biomedical researchers and administrative employees into one enviable location in Boston’s Innovation District. And it does so in a pretty spectacular fashion, featuring impressive architectural details like floor-to-ceiling windows that offer sweeping views of the city’s skyline and iconic harbor.